Free Spins: Following initial deposit, a subsequent wager of $/€20 or more on slots will earn you five free spins per day for 20 days on Starburst, a total of 100 free spins. An online casino run by the elusive and mysterious Mr Green awaits you, should you be tempted by one of the websites’ great introductory offers. 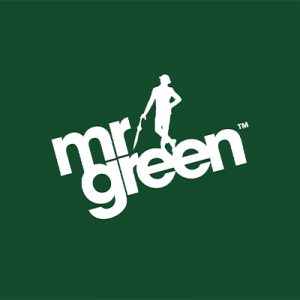 Founded in 2008, and therefore constituting one of the older online casinos, Mr Green has been able to adapt and improve it’s content over the years, to keep its site feeling as fresh and competitive as some of the newer online casinos. Mr Green also puts its customers first, offering a range of introductory promotions to suit your gambling style, as well as top-tier customer support readily available. Compared to other casinos, Mr Green’s game range of 300 titles may seem slightly limited, but with quality offerings such as games from NetEnt, who are well renowned for their fair-play ethos, as well as unique gaming concepts, and reliable game performance, you’re almost guaranteed to never become bored with what Mr Green has to offer. With a 24-7 support service, you can play worry-free, both on your PC and on mobile devices with the Mr Green app, which is available both on android and ios. Mr Green casino also offers a variety of payment options, including PayPal, Bitcoin, Neteller, and Skrill, allowing you to deposit with ease. Mobile users can also benefit from a whole host of bonuses and offers such as free spins, and with bonus’ on both the app the site often country-specific, Mr Green casino doesn’t leave you feeling left out, no matter where you live. With a minimum deposit of $/€10, or, to receive one of the three excellent welcome bonus’ a deposit of $/€20, you can enjoy one of the safest and fairest online casinos on the internet. From the comfort of your own home, or on the go with your mobile, winning has never been easier. Each welcome offer available directly reflects the main features of Mr Green’s casino experience. For those out for a classic online casino experience, Mr Green offers a matched bonus, as well as bonus spins when you deposit $/€20. Betting sportsmen are able to receive $/€10 Acc Free bet when betting $/€10, and for those wanting some live action, a matched bonus is available. For those playing slots, Mr Green also offers an additional bonus. Following an initial deposit on the site, a subsequent wager of $/€20 or more on slots will earn you five free spins per day for 20 days on Starburst, a total of 100 free spins. Mr Green also hosts weekly draws, in which 10 regular players can win funds credited to their accounts. Unlike most online casinos, the loyalty rewards that regular customers receive are assessed on an individual basis, giving customised rewards for the games you like to play and your play-style. The rewards system is known as the ‘Green Elevator’, players can use this system to accrue loyalty points which allow reward redemption. These rewards will appear in your inbox, so it is best to check regularly, to ensure you’re making the most out of your Mr Green experience. VIP’s also gain other benefits such as faster withdrawals, increased deposit limits, no fees, lower wager requirements, access to exclusive hosted events, bespoke promotions, personal account manager, and a one-to-one concierge service. Mr Green has a 35 times wagering requirement to be completed before players can redeem their winnings from their welcome bonus of choice. This condition mostly applies to slots and parlour games, though it is, of course, best to check the terms and conditions of any game you intend to play. Mr Green is known for having a straightforward deposit and withdrawal process. Players can deposit funds using Visa, MasterCard, Paypal, Skrill, Neteller and, Paysafecard, and a variety of different currencies are accepted such as Euro, GBP and CAD. Where possible payments methods are made with the same transfer processes used for your deposits. For your first withdrawal, you will likely need to undergo checking procedures, which can mean your payment could take 1-3 days to arrive in your account. After this, however, withdrawals can be a quick as 20 minutes. A minimum deposit of $/€10 is typically required, and the maximum deposit is set at $/€10,000. The minimum transaction for withdrawal is $/€30. As Mr Green casino is well-known for customer safety and security, upon your first withdrawal you will be required to provide proof of identity. Mr Green also requires proof of the bank account linked to the credit card, to do this, you need to screenshot your online banking account summary. If you are using an e-wallet, you’ll need to verify you are the owner of the e-wallet in question. To do this, log in to your provider and send Mr Green a print screen of your login page. Finally, you will be required to show proof of your address. Accepted forms of proof include bills, bank statements, or official letters or documents from a governing body. Your name, home address, and issue date should be clearly visible, and only documents received within the last 3 months are eligible to qualify as proof. Mr Green casino boasts over 300 games, to keep you entertained no matter your mood! Slots compromise the majority of Mr Green casino offerings, they feature classics such as Twin Spin and Starburst, as well as newer inventions. Mr Green has 30 blackjack style games to play alone, as well as 5 poker games with 3 Texas Hold’em variations, 2 baccarat games, and many other table style offerings. Blackjack, roulette, baccarat, and video poker are all live dealer games which are available on Mr Green casino, allowing you to get as close to a real casino as possible from the comfort of your living room. Many of Mr Green’s casino games are available through the app, include its recent sportsbook addition also. Security is one of Mr Greens top-priorities, and the site protects your personal information using 128-bit SSL encryption. Mr Green is licensed by both the UK Gambling Commission and the Malta Gaming Authority, it is also regulated by both these parties respectively. The casino is registered under ‘Mr Green Ltd’ (Registration number: C43260) and its base of operations is registered to Tagliaferro Business Centre, SLIEMA SLM 1549. Customer support is paramount to how Mr Green runs its business. Live chat is available on their website, to help ensure any issue you might have is resolved quickly and easily. Because it is so well established and has had over a decade to completely refine and streamline their casino processes, Mr Green offers a great place for beginners to start their online gambling journey. Its interface is user-friendly, and with both great customer service and security, you really are in safe hands. While they may not boast the largest selection of games, the range available is of high quality, and the numerous events and promotions held on the site ensure nothing becomes boring or stale for players. Overall, if you want an online casino that is going to take as good care of you as if you were in the VIP lounge in Las Vegas, then Mr Green is the place for you. With a great rewards program, amazing VIP opportunities, and 24-7 customer service, you can relax and enjoy great games, knowing everything else is taken care of.